Looking for a GREAT cycling getaway? We have private and comfortable accommodations for you! After a full day riding around the Lake Champlain Islands, you can settle in for a cozy night, rest your legs and know there's another route waiting for you tomorrow! Download a map of five popular cycling loops here! For over thirty years, gardener Harry Barber found a unique way to blend his native country of Switzerland with his new home in Vermont. 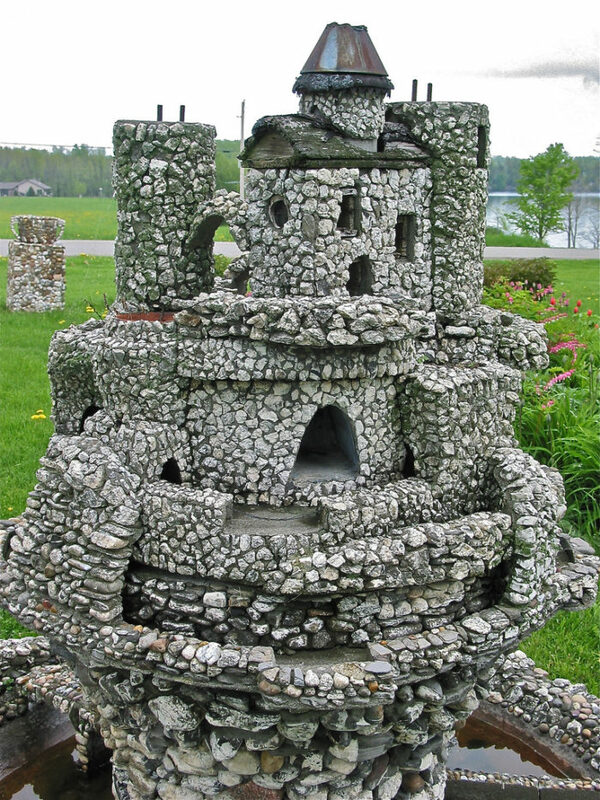 He created miniature buildings from local Vermont field stone. Five castles, three houses, and several garden structures remain in the Islands. They vary in complexity. Some castles feature glazed windows, interior fireplaces, or dungeons. Others are wired for electricity and have the capabilityof running water in the moat. Stone Castles leads you through the South Hero countryside, where you can see examples of Barber’s craftsmanship. All his creations are privately owned, and public access is not permitted). Four out of the five castles can be seen from the road. Stone Castles also passes through three large orchards, with a spring profusion of blossoms, luscious summer fruit, and a fall harvest celebration. For a short side trip, turn right on South Street (caution, narrow road). The panoramic view from the top of the hill is spectacular. South Hero has many castles, just not like the ones you'd expect. Island Life roams the back roads and shoreline of Grand Isle for a reflection of Island living, past and present. Island life historically focused on Lake Champlain as a transportation corridor for ferries and steamships. Today, the Islands and Lake Champlain provide recreation opportunities for boaters, anglers, and other water enthusiasts. On the hill behind Gordon House is the Ed Weed Fish Culture Station, open to the public with a self-guiding tour. There is a former one-room schoolhouse at the corner of Moccasin Avenue and Adams School Road. The Hyde Log Cabin, now a museum located on US 2, was moved from the corner of Reynolds and Hyde Roads. Built in 1783 by Revolutionary War hero Jedediah Hyde, the Cabin is one of the oldest in the United States. Popular Grand Isle State Park offers swimming, boating and interpretative programs. Its nature path offers an expansive view across the Inland Sea to Mount Mansfield and the Green Mountain ridgeline.